Be the first player to "bear off" (remove piece from board) all 15 playing pieces to win. Two players, taking alternating turns, move 15 pieces according to rolls of two dice. More skill than luck is required to bring one's own checkers home and bear them off first while blocking and hitting the opponent's checkers along the way. 1 board, 1 doubling cube to raise the game point stakes, 1 set for each player: dice cup, 1 pair of dice, 15 pieces. Backgammon is a wonderful game and an easy one to learn too. It had been played for centuries with little change. The basic rules are quite simple and it takes no more than a few minutes to learn. Mastering the game takes a bit longer. The board of backgammon contains four areas and in every one of these areas there are six triangles, known as "points". A bar is present in the middle of the board, thus "cutting" the board into to sections which are referred as the "inner" and "outer" boards of the players. There are thirty pieces, fifteen pieces per player. One of the "inner" boards is designated as the "home" board. To begin play, peices are placed representing the middle position of the game with the pieces placed at different "points" on the board. Opposing pieces are placed mirrored of each other with five pieces placed on the highest "point" in the inner "home" board. Two pieces places at the farthest "point" on the board. In the outer board there are three pieces placed just outside the inner "home" board with one "point" open between. And five pieces placed on opposite outer board, 7 points back from "home". The two players move in opposite direction, which one's goals is to reach his "home" board and then to take his pieces off the board. The objective of the game is to be the first player to removed your 15 pieces from the board. 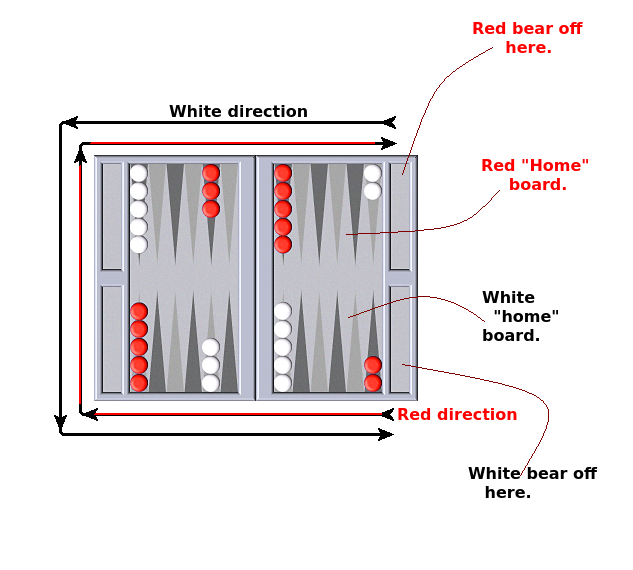 There are several methods of scoring a backgammon game. A game is won simply when the player is able to remove all his checkers from the board first. In a single game, if the losing opponent is able to remove at least one of his checkers, the player gets the number of points, which is previously determined by the face of the doubling-cube. If no cube was used, 1 point is given to the winner. In a double game or often times referred to as a gammon, the player wins twice the amount of the cube. This occurs when the losing player has not removed a single checker from the board. If no cube was used, 2 points are given to the winner. Lastly, a triple game or backgammon occurs when the winning player has successfully removed all his checkers from the board yet the losing player has not removed a single one of his checkers from the board and at the same time, still has checkers on the opponent's "home" board or on the bar. The winning player gets three times the amount of the cube. If no cube was used, 3 points are given to the winner. To make things more interesting, doubles was introduced to the game in the 1920's. When the player thinks he has the upper hand, he can opt to double the game. This effectively raises the stakes to twice the original game point amount. 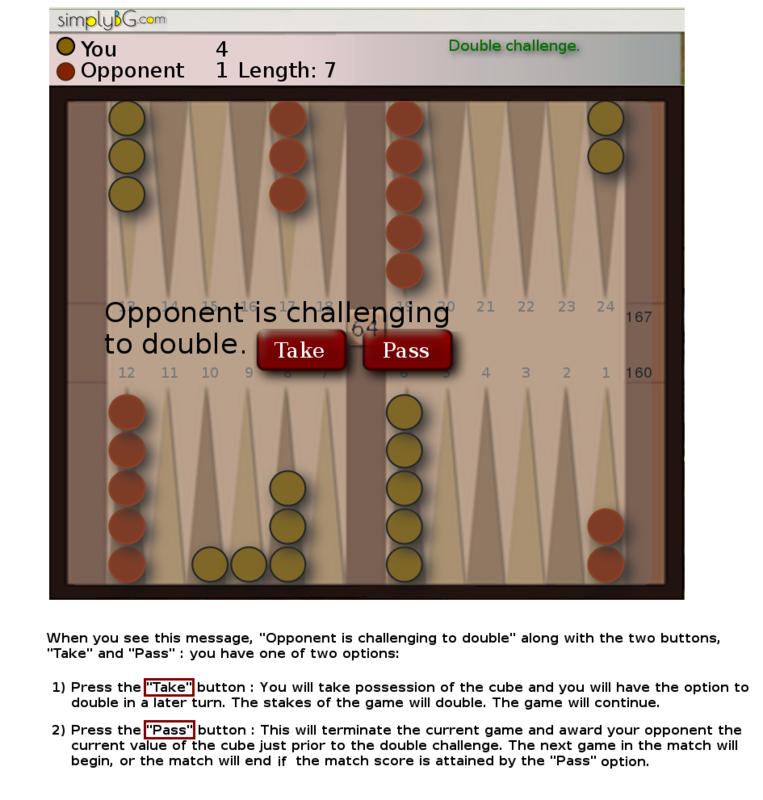 The opponent has the option to accept the double or resign the game. If he resigns or concedes, he loses the game and the opponent is awarded a point. By accepting the double, he effectively becomes the owner of the cube and now has the option and advantage of controlling the cube, and offering to double again. 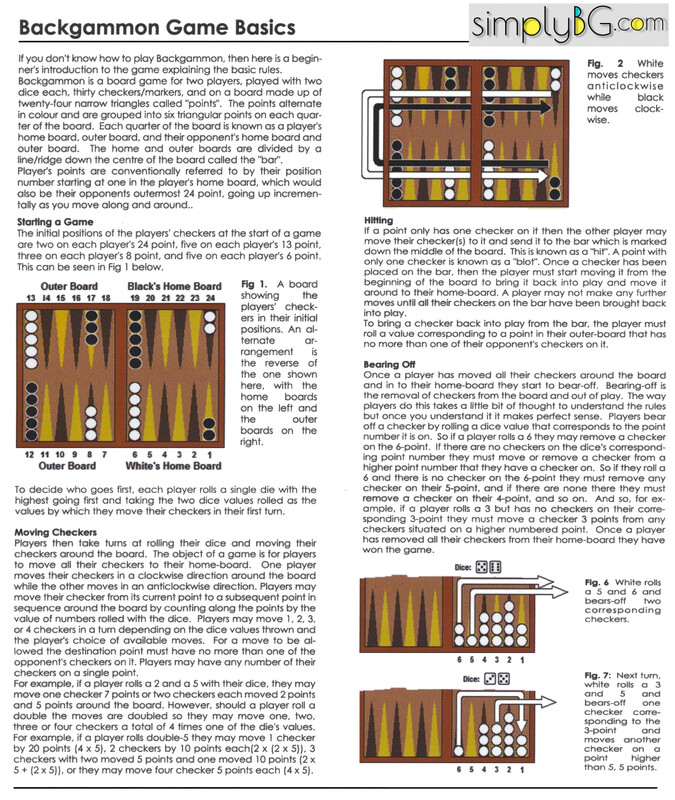 For more detailed documentation, please visit Backgammon Galore, FAQ on The Doubling Cube. Please see these resources for information on the Double-Cube challenge. There is no limit as to the number of times the game can be doubled. However, doubling must be done at the start of the player's turn and before the dice are rolled. When betting on backgammon, you can play for a certain amount per point or you can opt to play a match for a pre-agreed amount. There are other optional rules oftentimes used when playing for money. Automatic doubles occurs when both players happen to roll the same number at the start of the game to see to who moves first. In this case, the game is automatically doubled (ie the doubling cube is turned to 2 at the start of the game). The Jacoby Rule if adapted states that in order for a gammon or backgammon to count, the game must be doubled. Otherwise, it is considered a single game. The Crawford Rule applies to matches being played with a doubling cube. When the leading player comes within one point of winning the match, the following game is played without a doubling cube. This one game without doubling is called the Crawford Game. After the Crawford game, the doubling cube is back in play again.